Siesta and Longboat Keys share much in common. Fine sugar sand beaches, magnificent views of the gulf and bay, fine restaurants and a resort lifestyle, all combined with the promise of owner occupied neighborhoods with a small town feel, where neighbors know one another, yet respect each other’s privacy. But Longboat Key has recently added an amenity related to that last item – privacy – that has become elusive for some on Siesta; and It will likely make quite a few homeowners here facing what they describe as an assault on their right to the peaceful enjoyment their properties – envious. You see, Longboat has initiated a serious push to enforce rules regulating short-term vacation rentals aimed at protecting the single-family ambience of the town’s residential neighborhoods. Those rules are much the same on Longboat as on Siesta. Homes zoned Residential Single Family (RSF) are prohibited from being rented out for periods less than 30 days. Trouble is, that rule has been routinely ignored for many years by some property owners and overlooked or misunderstood by their rental agents…including companies like the increasingly ubiquitous AIRBNB and VRBO. And enforcement on both island communities has often been a long and tortuous process, which has frustrated homeowners who have awakened to the heartbreaking reality of their once peaceful neighborhoods taking on the character of a year-round spring break resort. In the past, it has taken months for Longboat officials to document violations and track down the owners of properties breaking the 30 day rule; but now the town’s code-enforcement officers have been armed with new tools to quickly get the attention of offenders – including the ability to write tickets on the spot – even to renters if they are uncooperative with the code officials. The new guidelines were approved by the town commission and took effect June 4th. “The tickets start at $100 for a first offense, jump to $200 for a second and then move to $500 for a third and all violations after that,” Longboat’s Planning and Zoning Director Allen Parsons told the Siesta Sand in a phone interview last week. And Parsons points out that these are real tickets, like speeding tickets. 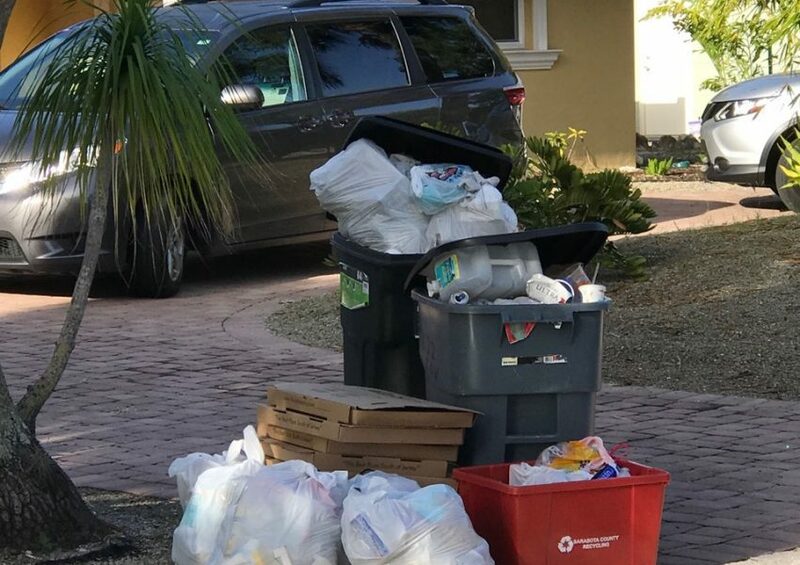 That’s a huge difference from a ‘notice to appear’ as often occurs on Siesta after county code enforcers like Susan Stahley spend hours, days or weeks tracking down the owners of homes where neighbors complain illegal rentals are occurring. The addresses are not listed in the ads online, so they have to be matched with the actual homes they are describing – often a painstaking process. As for fines? Well, that’s often up to a special hearing magistrate. How often are such fines levied here? Almost never. We asked Stahley how many fines had been assessed over the past year for short-term rental violations for RSF homes. Her response? ‘It’s not her fault,’ points out Volpe who has dealt repeatedly with the issue of such violations in his own neighborhood off Higel Avenue, as well as island wide as an SKA director. “That’s up to the judge. I think she’s frustrated too,” referring to Stahley. Such frustration is nothing new. John Lally was the code enforcement officer covering Siesta before retiring in 2015. We followed several of his non-compliance rental cases through the hearing process before a special magistrate for a story we ran on the issue that year. In both cases we observed, after establishing repeated violations had taken place, the magistrate asked Lally if the owners were now in compliance. When he replied that they were, the hearing ended with any accumulated fines waived. In one case the entire process from beginning to end stretched out eight months. After the last hearing we attended, we asked Lally how many fines had been levied in his eight years on the job. His answer? Apparently things haven’t changed much, though Volpe does add that several homes have been brought into compliance in recent weeks and he is grateful for that. He just wishes the process could proceed with a greater sense of urgency and efficiency. “It’s a heck of a thing to hear music blaring and people swearing and yelling…you can hear them even when you’re inside your house,” he said. “And cars and motorcycles speeding down your street at 60 mph. They should live out here and see how they like it,” he continued, referring to County Commissioners and policy makers involved in setting the framework code enforcers like Stahley have to work within. Things were much the same out on Longboat until the paper chase approach was abandoned in favor of the new streamlined enforcement effort adopted earlier this summer. Instead of months, code enforcement offers can now respond within a day or two of a complaint by a neighbor and begin enforcing compliance on the spot. Planning and Zoning Director Parsons tells us 32 tickets have been written by the town’s code enforcement officers since the town commission there updated their guidelines in June. This piece was filed on August 16th, so the number will likely be considerably higher by the time this story is published. Two of those tickets were even given to renters, which Parsons explained can be issued at the officer’s discretion if renters are uncooperative or in some way obstruct the officer’s efforts to determine who rented them the property in question. Of the 32 tickets issued, Parsons noted that only two have been contested. And the town has already held the contesting hearings for both. “They were both upheld,” Parsons added with just a hint of satisfaction. The new approach has been welcomed by Longboat residents like Penny Kentosh who watched for years as the home next to hers in the Country Club Shores subdivision of single family homes skirted the rules. “We get what we’re supposed to have out here, which is a one month minimum and not overnight and weekly,” she added. A call to Sarasota County Zoning Administrator Donna Thompson seeking comment on this story was not immediately returned prior to publication. We were able to reach County Commissioner Alan Maio, however, and asked if he thought Longboat’s heightened enforcement efforts could be adopted on Siesta Key. Which is of course where Longboat and Siesta now diverge. Longboat’s new enforcement model did interest Maio enough for him to say he will add it to his list of topics to discuss during his next meeting with County Administrator Jonathan Lewis, scheduled for late August. Siesta Sand will follow up on this story in coming months to update progress on the issue on both Longboat and Siesta.